Professionals who want to acquire a better understanding of IBM Power Systems™ products should read this paper. 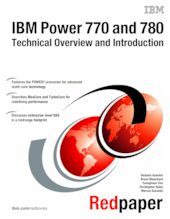 This paper expands the current set of IBM Power Systems documentation by providing a desktop reference that offers a detailed technical description of the 770 and 780 systems. This paper does not replace the latest marketing materials and configuration tools. It is intended as an additional source of information that, together with existing sources, may be used to enhance your knowledge of IBM server solutions.